Living at Symphony Senior Living Inglewood makes it easy to enjoy every moment, while creating new and lasting memories. Experience our elegant dining room or our bustling bistro; join us for a scheduled afternoon outing or simply soak up the sunshine in our courtyard. 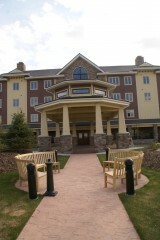 Symphony Senior Living, Inglewood combines exceptional services in a warm, vibrant atmosphere. Our residents enjoy wonderful food and hospitality, our dedicated staff is always there, whether to listen or lend a helping hand, we are here for you. We have combined every enjoyable aspect of living together in one modern, state of the art location. Let us cook and clean while you relax and enjoy your retirement. Red Deer is conveniently located halfway between Calgary and Edmonton; Red Deer is Alberta's third largest city with more than 92,000 (as per census) residents. The city of Red Deer and the surrounding Red Deer County offer excellent recreational activities. Inglewood has been viewed 51 times over the past 30 days (4853).